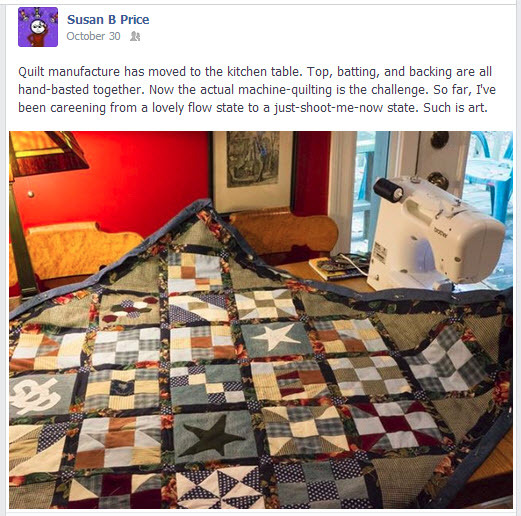 >>> Quilting is like Adobe Photoshop. It has an infinite number of moving parts to explore but is actually learnable, with lots of free online instruction at all levels. 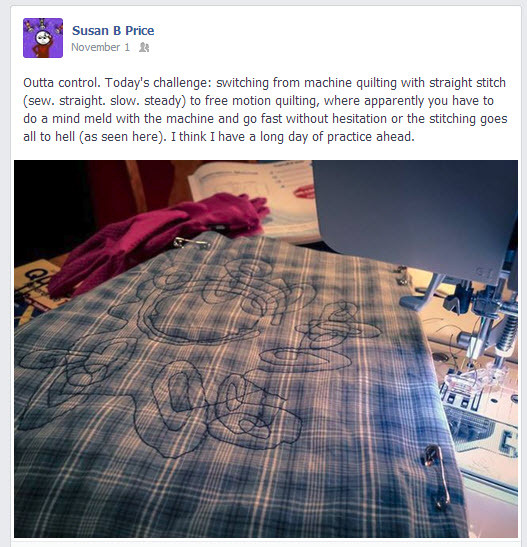 >>> Quilting from discarded clothing is liberating. I'm liberated to find my way, to learn without obligation. The only mandate is to experiment. No need to be artsy or worry about gift-giving or contests. The product will be a visible learning history. >>> I experiment with simple needle-turned appliqué (the stars and "sbp") and English paper-piecing (the hexagons). Hand-sewing is enjoyable because I can sit in my comfy chair in front of the TV. But I love my sewing machine. It is mastery and movement. It is power. >>> The piecing begins with more or less random fabric choices from a pile of Jim's old shirts and jeans. When I get a few 6" squares done, I am happy to see a color scheme emerging -- blues and creams, with brown, maroon and black accents. I have my palette. Next choice is fabric for the sashing between the blocks. The idea to use an old flowered skirt from the 80s begins pulling the piece together. The rosy floral enchants the homely guy blocks. I wonder where inspiration comes from. I make believe that if I'm quiet and focused enough, I can hear a spirit (who?) whispering guidance to me. >>> I'm developing a relationship with this slow work of art. We converse. I feel my energies flowing into it and I'm insisting that it give me energy back. 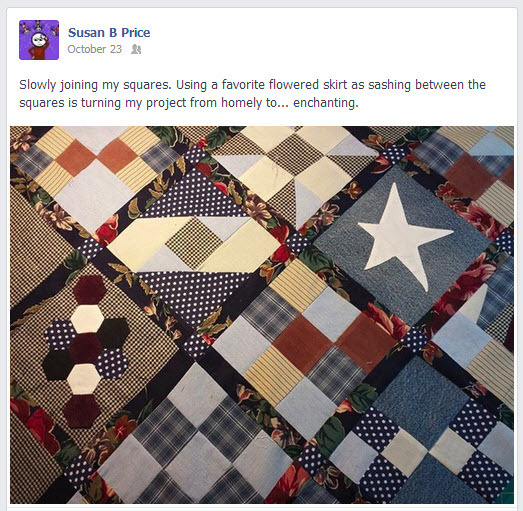 Quilting can be back-breaking and shoulder-knotting and neck-wrenching, but I'm insisting that this doesn't happen. I want the process to make me stronger, not break me down. >>> I'm careful not to think negative thoughts as I'm working because I think the fabric will retain those memories. So I'm listening to Robert Thurman on Buddhism, or Natalie Goldberg on writing as meditation practice. I'm working in the kitchen to enjoy the company of Jim and Hermanita, so that they will also be incorporated into the memory of the work. >>> I name my quilt "Garden of the Unexpected." >>> Quilting makes me AWAKE, makes me PRESENT, gives me permission to explore the byways and backwaters of imagination. It is a landscape full of places to explore, like our roadtrips west. >>> We go to the quilting guild show in Williamson. The creations on display are gorgeous and impeccably planned and executed (with the actual quilting done by a second person with a long-arm quilter). By comparison, mine is half-planned, relying on the serendipity of the closet-found fabric and experimentation among the squares. I won't win any contests this way, but the process seems to open up a yummy space between my controlling intellect and "Inspiration." I'm having fun giving this inspiration as persona: "who are you, breathing your ideas into my head, whispering to me as I stare at a problem?" 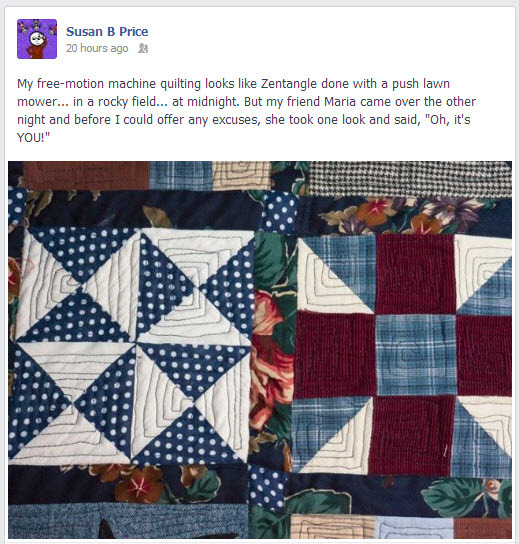 >>> Free-motion quilting is a wild ride. On the machine you need to lower your feed-dogs and change to a darning foot. This is equivalent to a switch from walking on a treadmill to figure-skating across a frozen pond. 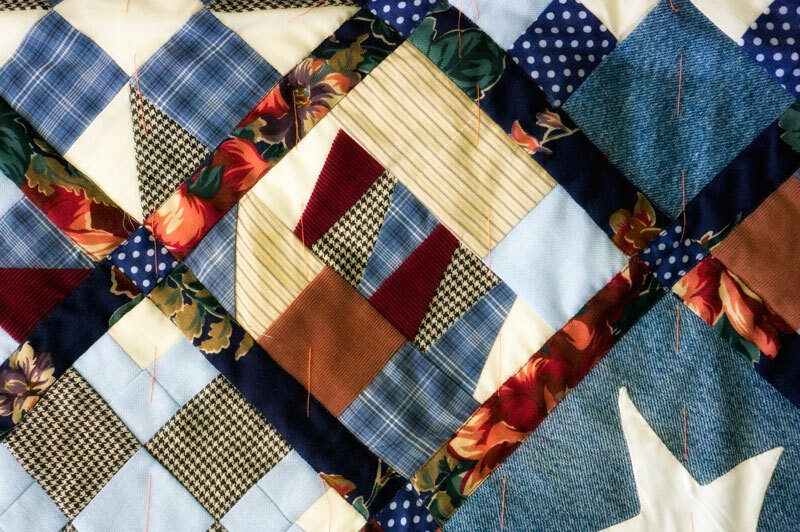 >>> Despite a day of practice on small squares, shoving my whole quilt under the needle and expecting my hands to control the stitches by smooth millimeter-length movements is overwhelming. My hands seize up with tension. My arms tremble. I spent some time this week looking at different quilting fills for my various squares. It's quickly clear that I need to do ONE fill pattern. I choose the squared spiral, as taught by Leah Day. Maybe after a hundred repetitions, I will be able to do ONE pattern competently. I play music. Barry White, Aretha Franklin, the Four Tops: the beat energizes me and helps my brain relax and focus but they work no magic on my hands. I wonder if I'm getting Parkinson's. >>> It's a poor artisan who blames her tools but, just as I MIGHT be getting the hang of this figure-skating, my upper thread starts breaking and the machine tension goes wonky, throwing up ugly loops along my sewing line. I try to stay calm. I replace the needle. I clean out the accumulated fuzz from around the bobbin case. I rethread, rethread, rethread. I don't mind facing my own wobbly spirals but I can't tolerate the machine's unstable stitiching, so I take a break to rip out three spirals. >>> I'm old enough to understand that skill-building is as much about tenacity as it is about talent, so I finish quilting my 25 blocks and my 20 edge triangles. I've gone overboard with the quilting, as it turns out. The lap blanket is a little too stiff now -- feeling more like an oversized place mat. Not to worry. The next challenge will be making the bias tape to bind the edges with. Top photo: the quilt prior to free-motion quilting -- layers basted together (orange thread) and machine quilting with a straight stitch around all the sashing (sashing = the flowery lanes between the squares). Other images are from Facebook entries. *Favorites on YouTube: Leah Day for free-motion quilting inspiration and how-to. 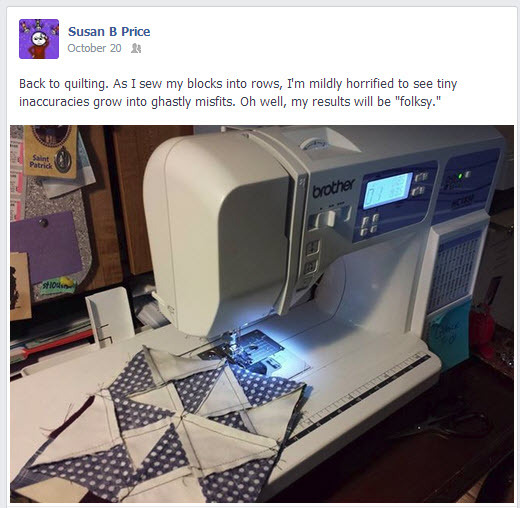 Missouri Star Quilt Company for general cheerful and informative tutorials. Hillbilly Handiworks for English Paper Piecing. Crafty Gemini for very practical tips. Fons & Porter, practical how-to and inspirational guests, including Quilty series for beginning quilters.